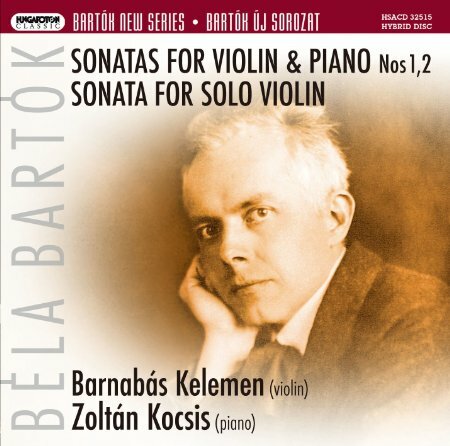 Bartók's two violin sonatas are sacred cows for modern music enthusiasts and those interested in the violin/piano repertory. As the most prestigious representatives of their genre in the 20th century, they've attracted the attention of numerous recording artists, despite their difficulty for casual listeners. This Hungaroton release adds to an impressive array of available options, and I'm glad to say that it holds its own with the best of the alternatives. The late Zoltán Kocsis (who died in 2016) is pretty well known, but violinist Barnabás Kelemen was a real revelation for me. Like Kocsis he "gets" this music, and he typifies an admirable trend among contemporary violinists to move beyond the habitual thick vibrato that has been the standard ever since the Fritz Kreisler era. Given the technical and rhythmic complexity of this music, particularly in the solo violin sonata that concludes the album, this "cool" approach to the instrument is a welcome one. The violin/piano sonatas were written in 1921–2, about the time of The Miraculous Mandarin, and in-between the Second and Third String Quartets. I've been especially intrigued by the First Sonata ever since I struggled to sit through it upon hearing it for the first time as an undergraduate music student. It's probably Bartók's most uncompromising piece, a half-hour of unapologetic dissonant modernism filtered through a prism of Eastern European folklore. Like Beethoven's late string quartets, it doesn't give up its secrets easily. Though the musical language is often atonal, Bartók doesn't discard tonal harmony completely. The work begins and ends with an implied C# minor tonality, for example. But this is articulated using the composer's unique chordal vocabulary, and a melodic emphasis on axial themes (those alternating on either side of a central pitch) and symmetrical scales, notably whole tone and octatonic (the latter alternating whole tones and semitones). It's these features, coupled with the rhythmic influence of folksong, that give Bartók's music its characteristic sound, whether it's at its most complex (as here) or in a more familiar guise (as in, say, the Concerto for Orchestra). Keep the D♮- D♭ with either the F or the B♭ and you get another derivative, which Bartók liked to use melodically: a minor third with a minor second tacked on. This is how the theme from the scherzo of the Second String Quartet is built, and it's how Bartók starts the violin theme that enters in bar three of the First Sonata. Interestingly, the violin's first note in the piece is a sustained C♮ which is one of the few notes not included in the opening piano arpeggios. Indeed an ongoing principle in this first movement is the separation of material between the two instruments, even though they inhabit the same harmonic landscape. The violin part emphasizes trills, tremolos between two fingerings of the same pitch, and long sustained pitches. By contrast, the piano part tends to alternate between the kinds of arpeggio/filigree patterning I mentioned previously, and short dissonant chords. As rhapsodic as the movement seems, it does follow a sonata form outline, even from a tonal perspective. The recapitulation occurs just before 8:00 (rehearsal 20), with the violin again starting on C against the same piano alpha chord as before, albeit in a new voicing. The movement ends with another major/minor construction (A-C double stop in the violin, A♭ in octaves in the piano), where again the pitches are segregated between the two instruments. As a whole, this movement is one of Bartók's most original, complex and introspective creations. The slow second movement begins with a violin cadenza that emphasizes minor seconds, minor thirds and major sixths. Express these intervals as multiples of half-steps and you get 1:3:9. Conspicuously marginalized in this scheme are whole steps, and other intervals built thereof (like major thirds). And it should not surprise you that when the piano plays its first melody at 1:40, it's based on the previously excluded whole tones. The piano temporarily wins this "argument", as the violin switches to whole-tone based intervals during the succeeding duet. But when the piano drops out again, the solo violin reverts to its old intervallic ways. The middle section rises from a low F# pedal point in the piano, a C pedal point in the violin, and increasingly intense violin arpeggios built atop this tritone. It's a remarkable Hungarian peasant dirge combined with quintessential Bartók "night music". After two build-ups the section culminates in a passage featuring parallel minor ninth double-stops in the violin. After this the violin reprises the start of its opening cadenza, then continues with the piano in a varied reprise of the rest of the first section. The movement ends with a brief recall of the central dirge tune. This is usually troublesome in performance, a bunch of fast notes at the bottom of the instrument's range, and most violinists struggle to be heard over the piano. Indeed the entire first 2½ pages of the score direct the violinist to use the G string. Kelemen pulls it off though: there's plenty of volume, and he even sounds lithe while playing on his thickest string. The piano's oom-pah accompaniment and sixteenth note interjections emphasize mixed fifth chords, jacking up the dissonance level even by Bartók standards. We're in rondo form, and first episode is another of these Bartók peasant dirges that emphasize long repeated notes (high E in the violin). A special moment in this recording is the return of the ritornello at 3:45. The effect reminds me of a freight train starting up, and to his credit, Kocsis stays off the sustain pedal here, unlike a lot of pianists whose feet are seemingly welded to it. Whereas in the first two movements the two instruments generally had their own separate melodic material, in this movement the tunes are often shared or exchanged (e.g., the piano anticipating the two reprises of the main theme). The second episode is a bit slower in tempo, but still dance-like, emphasizing a quintuplet pickup to the downbeat. The final recall of the ritornello leads directly into a coda where the previous episodes are combined with the ritornello in a developmental fashion. My favorite recording of the First Sonata is a 1972 live performance by David Oistrakh and Frida Bauer that was captured on an old Praga release, and reissued more recently in a Brilliant Classics compilation. But Kelemen & Kocsis come closer than anyone else to capturing Oistrakh & Bauer's magic, and of course they do so with far superior recording conditions. Whether you admire Bartók from an intellectual or a more visceral perspective, you shouldn't be disappointed with this rendition. All this leaves me with little to say about the performances of the Second Violin Sonata or the Sonata for Solo Violin, other than to assert that the former matches the First Sonata in intensity and precision, while the latter is an ample display of Kelemen's formidable technique. In the solo violin sonata, Kelemen opts for the difficult quarter tones in the finale. Bartók was a musician's musician, and if you already count his Third and Fourth String Quartets among your personal favorites, then you're ready to take on these three pieces, which represent Bartókian modernism at its most steadfast. Even if you enjoy Bartók's music based only on his most popular works, you should still acquaint yourself with the pieces in this album. Don't give up after one or two hearings, but ease yourself into the musical language gradually, and the logic of these compositions will eventually reveal itself as you learn the melodies and recognize their repetition. Kelemen and Kocsis do a fine job with this challenging material, and you can rest assured that the music is not lacking anything essential in their capable hands. Original Material and HTML Coding Copyright © 2015–2017 by Michael Schell. All Rights Reserved.